Just flipping through channels, we came across the new VH1 reality show featuring Public Enemy Rapper Flavor Flav; Flavor [as his friends call him] is famous for two things: 1) saying "YEEE-AH BOYZ!!!!" 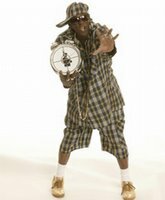 and 2) wearing large clocks around his neck. This reality show is a Bachelor-like dating show where he picks from a large group of girls to find his love match. But instead of giving the girls roses, what does he give to the ladies? Oh yes: large clocks to wear around their neck. How is this not the greatest show on television? Bring the noise. Fight the power. Older PostBad Boys . . .